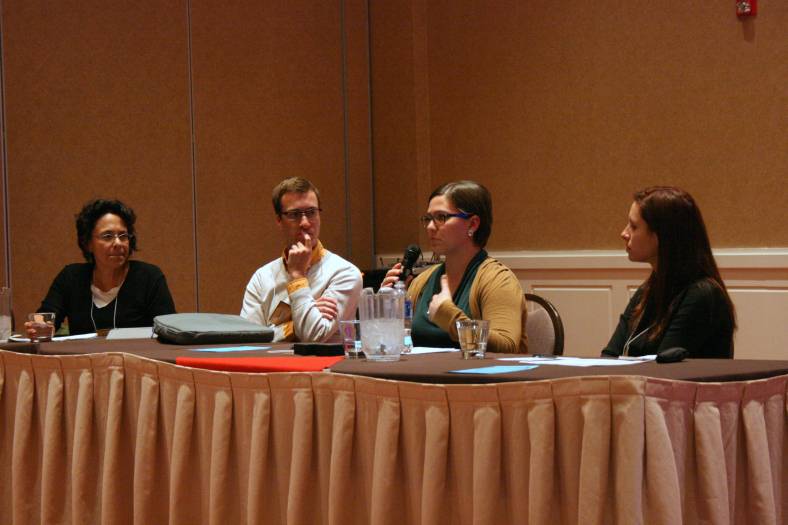 At the recent Society for Applied Anthropology annual meetings in Albuquerque, NM, I had the opportunity to participate in a panel session with three other up-and-coming anthropologists who work in business and design. The session, entitled “Coming of Age in the Corporate Context: Exploring the Non-Linear Transition from Student to Practitioner and Back Again,” was chaired by Angela Ramer (U. North Texas). The other two participants were Shane Pahl and Gigi Taylor (also students at UNT). From left to right: Gigi Taylor, Shane Pahl, Amy Santee, and Angela Ramer. Note: A link to the live audio recording of our session (and corresponding presentation slides) can be found here. As the title states, our panel focused on the “non-linear” path from student to practice in a business context, based in our varied perspectives and professional experiences. To start, Shane discussed the steps he took during his undergraduate and graduate journey to prepare for practice in business. Angela reflected on her time working at a global architecture firm where she did her MS thesis research and is still currently employed. Gigi gave a refreshing discussion of anthropological education and socialization, focusing on her journey from the world of qualitative research and advertising to the world of applied anthropology, and talking about how studying anthropology gave her a whole new lens to look at her work. Finally, I reflected on how I’ve developed as a practitioner in my three years working in business (corporate, freelance and agency work), and the things that have helped me to become a more effective and successful anthropologist and employee. What I enjoyed most about our session was the coming together of these four perspectives and how they played off of each other so well, even though they drew from relatively different experiences of what it means to do anthropology in business. The session clearly illustrated that the path to business anthropology is not a singular or linear one – and that while preparation in a MA program gives you important foundational knowledge of theory, methods and (hopefully) application, it usually comes down to figuring out things on your own once you leave academia behind for the workplace. Here are some of my favorite insights from each talk. A helpful approach to transitioning from school to work is to define, execute and redefine your professional goals. Don’t be afraid of broad or vague professional goals. It’s OK to be interested in a lot of different things. Career centers may be more helpful than your department for teaching you how to actually describe what you do as an anthropologist in a jargon-free way. Twitter, blogs, and listservs are great places to learn about what business anthropology is and to ultimately define it for oneself. Participating in the online anthropology sphere can also make you feel like you are truly entering the community of practice. You develop your approach and skills as an anthropologist in phases: first, by learning methods and theory, then by doing a real-world project in school, then by presenting your research to others for feedback, and then finally by entering the world of application (i.e., getting a job). A major milestone of a developing anthropologist is to interact with non-anthropologists and be able to explain your work to them in five minutes or less. You know you’ve made it in anthropology when a client appreciates your research insights and finds them useful for decision-making. Your six-page CV doesn’t matter to a recruiter looking for a one-page resume. New practitioners should expect their coworkers to ask them what they are capable of doing, and have the words to describe it. When you’re in school, you are taught that you have to do research in a specific way, with a specific approach, in a specific order of steps, based on a research plan that’s prepared ahead of time. This is not reflective of how research happens in the real world. There is a desire (even a struggle) to try and maintain academic rigor, meet client needs, and follow the IRB process. It’s never going to be perfect. As a student working on an applied project with a client, you have one foot in academia, and one in industry. You have your network of professors and other practitioners, but ultimately you have to troubleshoot on your own. Working in industry is iterative, ambiguous, and evolving all the time. It’s extremely important to be visual in your reports and proposals in the design world. If you can put a story to the numbers (quantitative data), they become much more meaningful. As an anthropologist in industry, your work should lead to change. You should be active in the change process. There is a difference between working as a qualitative researcher at a marketing firm and working as an ethnographer in an anthropological consultancy. Taking theory courses is like sitting next to the fire, learning great stories about the family, the founders, and the lineage of the discipline. Going to school and learning how to become an anthropologist isn’t just about learning theory, skills, knowledge; it’s also about the transmission, reproduction, exchange and negotiation of culture and anthropological identity. Checking out a bunch of theory books is not the same as the shared experience – the rite of passage – of anthropology graduate school. Clients want very specific stories because they serve as the muse for product, marketing and advertising strategy – in turn, anthropologists have to help clients avoid essentializing culture and consumers. The word “culture” has a history and baggage – it gets thrown around by clients without much regard to what it actually means.